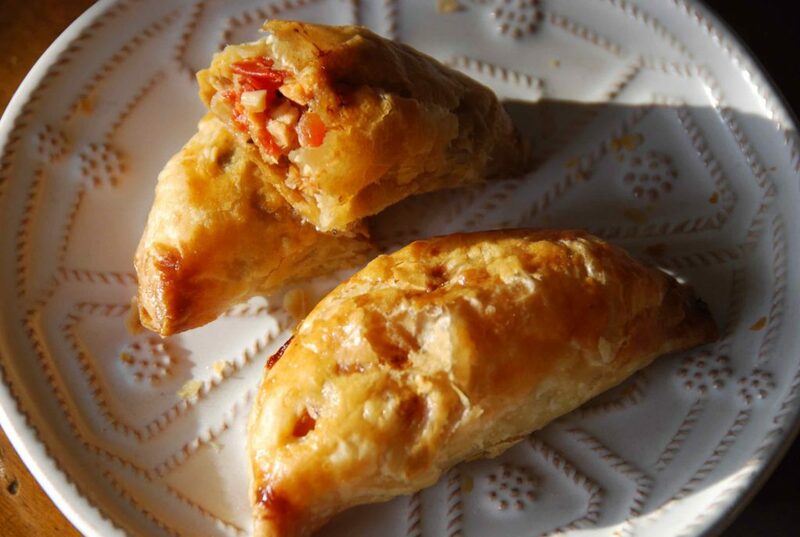 Insanely practical, that’s what these empanadas are. Perfect to make ahead for gatherings, as you can eat them hot or not. And they are oh, so, comforting: think of a tuna casserole in the good old style, but revamped with great Mexican flair and then flipped and turned into individual size. They withstand hours of travel and will remain delicious until you are ready to take a bite. 1. Make a double batch. 2. If you don’t, refrain from telling your friends about the fabulous thing you prepared but couldn’t bring because you finished it before hopping in the car. They won’t like it. A simple way to describe an empanada is a turnover-looking packet stuffed with one or another kind of filling. The story goes that they’ve existed since the Spanish Crusades as they were perfect travel food. It was the Spaniards who brought them to Mexico. From the Spanish word “empanar,” which can translate as “the act of covering something with bread or bread dough,” aside from practical, they are also versatile. They can go from mini to giant, from savory to sweet, from a tasty appetizer or funky main meal to a sweet bite, depending on the fillings. I can think of three things that distinguish empanadas from quesadillas. First, whereas quesadillas are made with flour or corn dough (or flour or corn tortillas) empanadas are made with flour dough. That doesn’t make empanada variations limited. Oh no. There are as many fillings and as many flour doughs as one can think of. One of the fluffiest ones are made with puff pastry, called hojaldre in Spanish. Delightful, because as it bakes, the seemingly flat dough develops its multilayered structure: paper-thin layers of dough puff up with air, and delicious butter, in between them. You can make your own puff pastry or simply buy it at the frozen section at the store. Just be sure to thaw before you roll out. Then make rounds. You can make them as big or as little as you like. Here I am cutting 5” rounds. Brush with egg wash (just a beaten mix of egg and water) around the edges. Then add the filling. A second difference between empanadas and quesadillas is that it is pretty hard to find a quesadilla that is sweet, for a good reason. Whereas not only are there plenty of sweet empanadas but even when they are savory, they have a sweet element to them, like the Tuna Minilla that is going in here…. 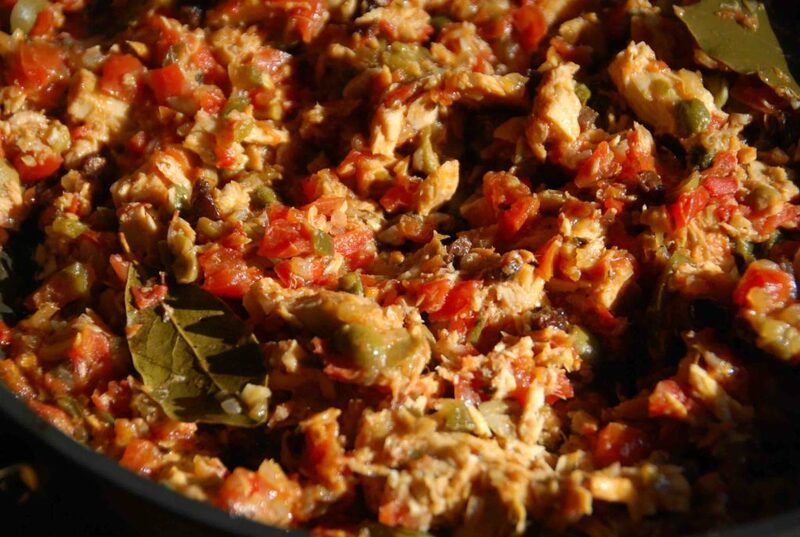 Minilla is a very popular way of cooking fresh fish and also canned tuna along the Mexican Gulf Coast, especially in Veracruz. It is so tasty and its flavor shows the impact that kitchens in Veracruz received from it being a port of entry to the Spaniards. It has a base of cooked onion, garlic, plenty of tomatoes, pickled jalapeños, along with the capers, olives, raisins and herbs the Spaniards brought. Pretty much like the Fish a la Veracruzana style. The sauce gets cooked until moist and the flavors have been completely absorbed and combined. 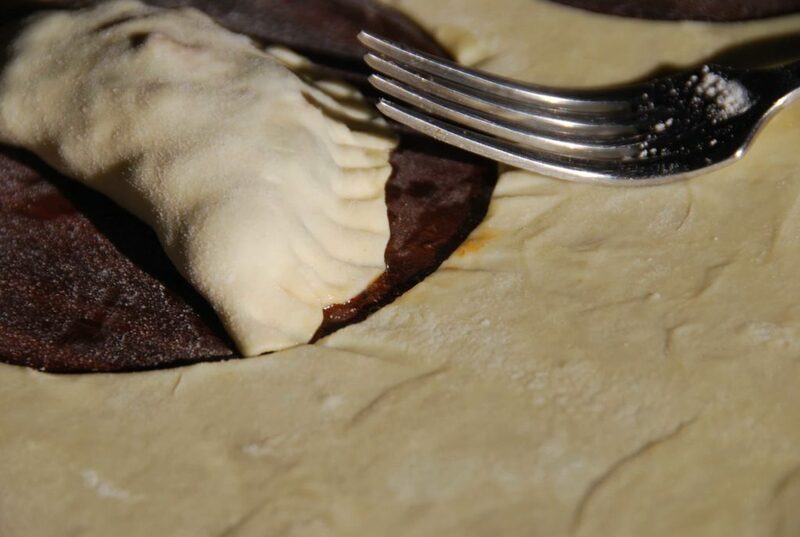 Then seal the empanadas by folding the circle over the filling. Then use a fork to not only decorate the edges but to seal them even better. In Mexico, many cooks know a fancy technique of decorating and sealing the edges of the empanadas so they look like encaje or embroidery. I go with the good old fork…. The third thing that distinguishes empanadas from quesadillas, is that empanadas are mostly baked. Not fried or cooked over the stovetop on a comal or skillet. Once in the oven, the puff pastry layers do what they must… puff and puff and puff, the top crisps, the middle gets moist, and the filling bonds with the packet. In a large skillet, heat the oil over medium heat. Once hot, but not smoking, stir in the onion and cook until it is soft and translucent, about 5 minutes. Add the garlic, stir, and cook until fragrant, about 1 minute. Stir in the chopped tomatoes and cook, stirring often, until completely cooked, softened and mashed up and pasty looking, about 15 minutes. Toss in the tuna and with a spatula or fork, mix it well with the tomato mix, making sure there are no big chunks. Add the bay leaves, sugar, oregano, thyme, salt and mix well. Add the raisins, olives, pickled jalapenos, capers, fresh parsley and mix well. Cover the skillet and reduce the heat to medium-low. Cook for about 10 minutes, the mixture should be very moist but not too watery. Taste for salt and add more if needed. Remove the bay leaves and set aside. Line two baking sheets with parchment paper. Preheat oven to 350. In a small mixing bowl beat the egg along with the water. 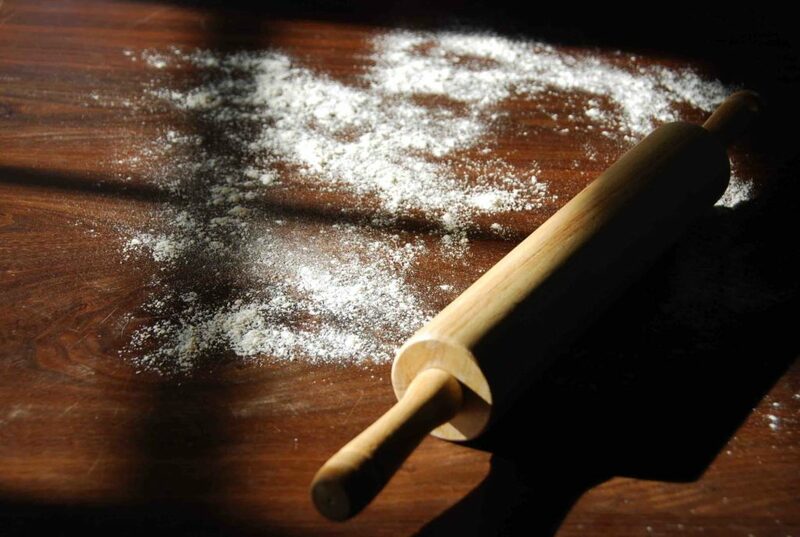 Gently flour your countertop and rolling pin and roll out one thawed sheet of pastry to about 1/8” thick. 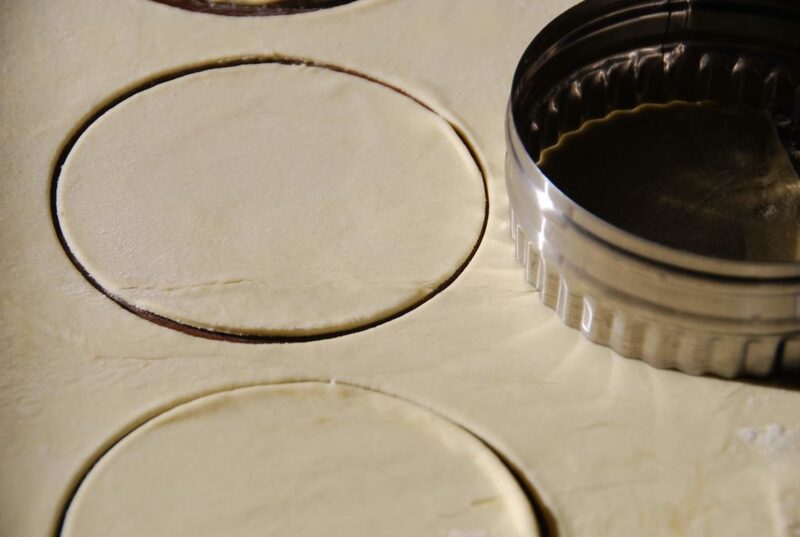 Cut out 5” to 6” rounds with a cookie cutter or anything that can act as a mold. 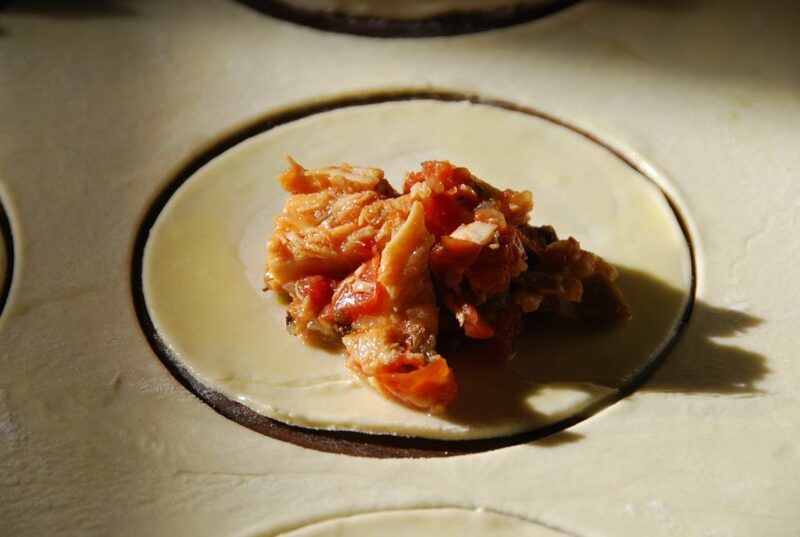 With a pastry brush, brush the edges of the rounds with the egg wash. Spoon about 2 tablespoons of tuna in the center of each round, fold as a turnover or quesadilla to make a half moon, pushing the tuna inside of the empanada at the same time as you press the edges of the dough to seal it. Gently press the edge with the tip of a fork, this will act as decoration but also help seal the edges. 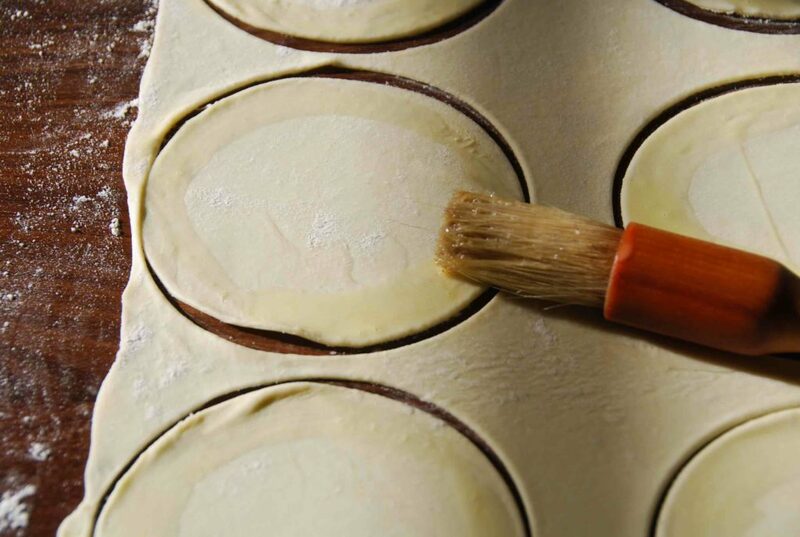 Place the empanada on a lined baking sheet and repeat with the rest of the rounds and the second sheet of puff pastry. When all empanadas are formed, brush their tops with the remaining egg wash.
Place them in the oven and bake for about 30 minutes, until crisp, puffed up and golden brown. Hola Pati! I am looking forward to making the tuna empanadas. Can these be frozen after baking? Love your shows! Oh I recommend waiting to bake them until right before serving. You can assemble and freeze them in a tightly sealed container, or snugly wrapped in plastic wrap. Then you can thaw them before baking, and enjoy! I have made these empanadas so many times because they are so good (I don’t even usually like canned tuna!) I have prepared and froze before baking and baked and then froze and reheated in oven. No problem either way. I usually double or triple the batch and always wish I made more…they’re that good! I’ve made the empanadas a few times and they are always a big hit. Tonight I used corn tortillas that I heated/crisped a little and they wee a wonderful way to eat the tuna minilla! Thanks for the great recipe. I’m so glad you enjoy the recipes, Donna! I left out some of the ingredients with I don’t like (olives, capers and jalapeños) and they still came out great! I just enjoyed your show on Tuna Casserole. I know you say use one sheet of Filo but it looked like you used several sheets. Will one sheet really work and puff up on it’s own? Hi Dyandra, Yes, one sheet should puff up on its own. Hope you try to casserole! Hi Pati- I made these this weekend and they were a hit! My husband and I loved them, and I used leftover filling to make calzones. I am Jewish from Argentina and I love the stories of your family’s Jewish roots and adopted Mexican customs. This coming Passover we are going to try Mexican dishes from your cookbook. Thanks! Hi Natalia, So happy you and your husband enjoyed the empanadas! And THANK YOU for getting my cookbook — you will have to let me know what you end up making for Passover. Hola Pati! Estas empanadas se ven súper sabrosisimas. Tengo ganas de hacerlas pero tengo una pregunta, se puede hacer una forma de pai con esta receta en lugar de empanadas? No tengo tiempo después del trabajo para hacer empanadas. Si es que sí se puede, me podrías decir como? Gracias. P.D. Me encanta verte en Créate TV! I have tried your tuna empenadas. It’s delicious and everybody likes it. I have watch your TV show today and I would love to have the recipe of beef barbacoa. I have tried your tuna empenada. It’s delicious and everybody likes it. I watch your Mesican cooking on Create and I love it. Could you please send me recipe for Carnitasd and the green salsa. Quisiera saber si me pudiera mandar la reseta de su Mexican Asian cooking,muy agradecida. Thank you for sending me this link, obviously we are of one Mind. thank you so much, these look delicious and just what I envisioned. I made these for a work potluck and everyone loved them! I don’t even like tuna and I ate one! Muy buena receta! Todas tus recetas se ven deliciosas! Quiero hacer estas empanadas y tengo una pregunta, a mi me encantan echarle a todo salsa, que tipo de salsa va bien con las empadas? Hi Patti, Is there an 800 number that I can call to order your cookbook. Are all the recipes from you T.V. show?? I’m very much a chicken lover, can’t wait to try your Chicken with tamarind. While reading your story of your Mother and Grandmother, it brought back memories of my mother hacking off the head of chicken on a tree stump and watching the headless chicken running around….Is that where the saying “Running around, like a chicken with his head off,” came from?? Patti, Can I assemble the Tuna Minilla Empanadas ahead of time and refrigerate them, also can they be frozen? I ask because I cook for two. Can I also substitute kalamata olives with a few tablespoons of chopped red roasted peppers?? I have all the ingredients on hand, except the puff pastry, I have to restock my freezer. I will be making this recipe today. I watch you show on Create T.V. Love it. Hola Irene, I’m so happy you are trying this recipe! Yes, you may make them ahead and refrigerate or freeze – I recommend waiting to bake them until right before serving. Just assemble and store in the refrigerator or freezer in a tightly sealed container, or snugly wrapped in plastic wrap. Thaw before baking if frozen. And, of course, you can sub red roasted peppers for the olives. Thank you so much for writing to me. I hope you enjoy the empanadas! LOOVE YOUR SHOW!!!! I LOVE YOUR RECIPIES!!! I’m a filipina but love Mexican food..your recipies are awesome! love, love your show..I’m a filipina married to a mexican husband who knows how to cook very well. But, watching your show gives me inspiration to learn how to think & cook mexican dishes because your recipies are very easy to follow…KEEP UP THE EXECELENT TV SHOWS!!!! Pati, Congratulations for your show. All your recipes are amazing! Hola Isa, I’m so happy the show brings back memories for you! Thank you so much for writing to me!! I will try to post a recipe for arroz a la tumbada soon. gracias por esta deliciosa reseta,como siempre facil de aser y ponerla en la mesa para saborear sus delicias. Mi esposo quiere saber el apellido de su abuelito de Bratislaba,sindo como le platique que mi esposo nacio alla y es sobrevibiente dela segunda guerra.Le mandamos las gracias anticipadamente. Great recipe but can you please include the Metric measuring system for us Australians? We haven’t dealt with pounds and ounces for the past 40 years (my whole life!). Hola Rocio: ahora solo tengo el sitio en inglés! Espero empezar a poner en español pronto, pero mientras, tal vez quieras copiar la receta y ponerla en Google Translate? Saludos! Hola Pati!! soy Tammy Justus – desde Portland! 🙂 Apenas descubri tu website y se me anotojaron las emapanadas de atun, las hice ayer y quedaron deliciosas!! Mil felicidades por tan grandes logros and I look forward to trying many many more recipes! con carino, tammy. Hi Pati! I learned about you on the CHEW today. You are the Latin Pioneer Woman!!!!!! I just purchased your cookbook. I can’t wait to begin preparing mexican food at home. I love love love mexican food and can’t wait to begin cooking. Thank you for making the food so easy to prepare. I look forward to seeing your show on PBS. God Bless you! Jolene, Thank you so much for buying the cookbook!! I hope you enjoy the recipes. Please let me know if you have any questions at any time. you are the best the Latin Paula Deen. Your teaching skills are very simple and easy to understand. Keep up the great work. Wishing you all the best. Thank you, Chef Gonin! I will have to check out your blog. Pati, I LOOOOOOOVE your show! My daughters ages 5, 7 also love to watch with me. I love how you describe your food and love reading your blog and recipes. So glad I found you on the Create channel! We love your accent and my daughters love to imitate it. 🙂 Keep up the great work. Just made a batch this week… they fly away from the kitchen each single time. Wishing that will happen to yours too. These empanadas look great. I would like to make them ahead and freeze them for a trip to the beach this spring. What are your recommendations, bake then freeze or assemble, freeze, and bake when I get to my destination. Many thanks for your wonderful show and website.